Football fans usually don't agree on much. Arguing is part of the fun. But nearly everyone agrees that this year's Super Bowl, won by the New England Patriots by only 13 to 3, was a snoozefest. Still, it was a welcome respite from acrimonious politics. What the game lost in the U.S.A. it gained in, of all places, Israel, which is learning to love American football and to show its passion like fans in America, adding another reason for our "special relationship." It's a fascinating story about how Robert Kraft, owner of the New England Patriots, and his late wife, Myra, helped introduce American football to Israel, built a small stadium in Jerusalem and assisted in organizing eight leagues with the current participation of more than 2,000 men and women. Some of the teams, particularly in the leagues for women, play flag football, a variation of touch football. There's also the real thing -- hard, hot, sweaty and swiftly growing in popularity. The connection between New England and the Holy Land is a curious one. The Super Bowl paid dearly for that infamous missed call that deprived New Orleans Saints of a shot at the league championship and then attracted the smallest Super Bowl television audience in a decade. Almost nobody watched in New Orleans (or would admit it), where the game was derided as the Boycott Bowl and the New Orleans Times-Picayune's entire front page was blank but for a single headline in the middle: "Super Bowl? What Super Bowl?" The morning after in Jerusalem, Tel Aviv and other Israeli towns and cities told a different story of the joy of fans in unlikely places. "Many Israelis came to work bleary-eyed having stayed up all night watching the New England Patriots defeat the Los Angeles Rams in Super Bowl LIII," the Jewish News Syndicate observed. "While the low-scoring affair certainly wasn't the most exciting of championship games, that didn't dampen jubilation." 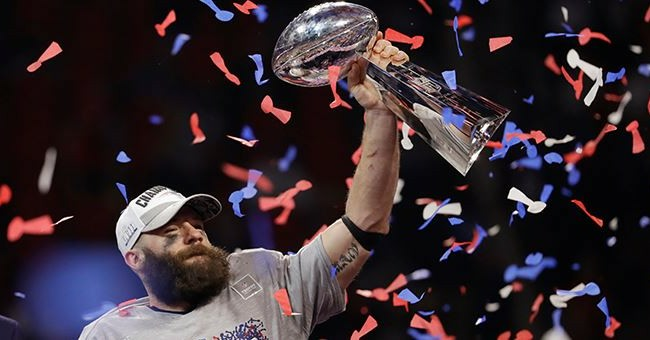 It didn't hurt that Julian Edelman, the Patriots wide receiver, is the first Jew to be named most valuable player in a Super Bowl. The New England Patriots, says Steve Leibowitz, co-founder and president of American Football in Israel (AFI), "are Israel's team." It was his friendship with the Krafts that put football on Israeli radar. The stadium built by the Krafts is part of a multimillion-dollar sports complex that is a joint project of Robert Kraft, the city of Jerusalem and the national lottery authority. NFL Commissioner Roger Goodell and 18 members of the NFL Hall of Fame went to Israel for the dedication of the sports complex two years ago. It's not easy to introduce a new sport to an audience with no knowledge of the game, its history and its traditions, particularly an unfamiliar game that is even now only the fifth most popular in Israel -- after soccer, called "European football," a favorite of moms everywhere because there's minimum physical contact, and knees, hips and heads don't take a beating. The other favorite sports are quieter: basketball, volleyball and handball. The popularity of American football exploded after Leibowitz and a friend, Danny Gewitz, started AFI with a handful of players playing touch -- or flag -- football. More than 800 adults and high school students are in a league that plays the traditional form with helmets, full pads and the hard hits that mark the game in the United States. This is a game that particularly appeals to Israelis, says Betzalel Friedman, the commissioner of the adult men's Kraft Family Israel Football League, and an evangelist for American football who sounds something like an American high school coach trying to sell a reluctant American mom on her eager son's enthusiasm for the hard-hitting American game. "Tackle football appeals to Israelis," he tells Jewish News Syndicate, "the physicality, the camaraderie, the strategy. It's actually good preparation for military service" -- in which all young Israelis participate -- "because football shares so many aspects, including hard work, perseverance, discipline and teamwork. And it also prepares you for life in general." The flag leagues, forerunners of the smash-mouth game, mostly originally consisted of Americans living in Israel, boys in high school, expats or children of expats. Now over 80 percent of the players were born Israelis or are the children of native Israelis. Several young men who learned the game in Israel have been recruited by colleges in the United States. One made it to Michigan, the Big Ten powerhouse, but never actually got in a game. But devotion to the game runs deep. Rachel Shmidman, a player in the women's flag league, says: "I was the weird kid in high school who walked around with a funny egg-shaped ball. (I was) the commander in the army who gave up precious hours of sleep to watch games at 1 a.m., the college kid who had to debate between watching the Super Bowl and taking a final at eight the next morning. ... Football has been the one constant in my life for almost 15 years, and I wouldn't have it any other way."